Around the time of the battle of Hastings in 1066 it is recorded that a small fort occupied castle hill. It it thought that sometime later St Catherine’s Island was established as a place of Christian worship by the creation of a small chapel built on the promontory of the island. Here high above the town perfect solitude could be found. 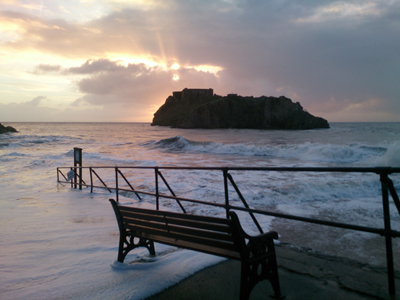 As the tide came in it brought seclusion, the opportunity to communicate with the Creator without interruption. 1859-1869 The Royal Commission On The Defences Of The Realm was undertaken. in 1866 The protection of Tenby and its importance as a landing site for Milford Haven and the Royal Dock Yard at “Pater” now Pembroke Dock was considered of vital importance. The construction of the Tenby to Pembroke Dock railway was under way and this would give further increased access to the Royal Dockyard. 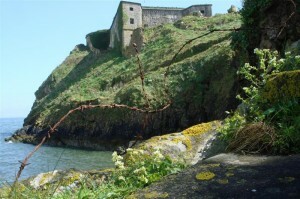 The fort was ordered as a direct result and the island was sold to the War Office for £800. A line of coast forts and/or batteries along the Pembrokeshire coasts was recommended but in the event only St Catherine’s fort was built protecting the main landing and access zone. Mr George Thomas of Orielton Terrace Pembroke secured the contract for the construction of the fort. In 1867 work began clearing the site and constructing the slopes and cranes for the mammoth task of lifting solid granite blocks onto the island and up into position to create the state of the art defence. Originally estimated to cost £16,620 by time of completion the actual cost had risen to £40,000 this final price included the cost of the guns and the iron shields installed in the six casemates. The fort was Designed by Colonel William Jervois The son of General William Jervois KH. In 1856 Jervois was appointed Inspector General of Fortifications at the War Office and in 1859 he was made secretary to the royal commission on the defences of Britain. It was Considered that the threat of invasion from France was credible and that defensive works should be instructed to repel such. A sum of £7,000,000 was raised to cover the cost of such works. Construction began around the country. This far sighted vision strengthened the fortification of the Empire creating a formidable obstacle for the would be invader. Conflicting accounts exist of when the fort was garrisoned and who may have served within it. The Army had control of the fort from 1887 -1895. The R.N.R. had control of the fort from 1895 –1907. In 1904 they installed a 5 inch B.L.C. on a Youngman’s compression platform on the south side of the island which was apparently used for training. There is mention that from 1914 to 1918 the fort was garrisoned. From 1939 to 1945 different detachments served in the fort including the Royal Marines, The Forth Defence Battery R.A., elements of the Belgium Army, The Home Guard, LAA(R.A.) and an R.A.F. ASR detachment. In 1939 the army were guests of the Windsor Richards family however, after a row with the family the army compulsory purchased the fort in November 1940. The fort was released by the military after WWII. Around 1907 the fort was bought by the Windsor Richards family who converted it into a house. This included installing parquet flooring in the casemates and lavish decorative features. They also built a 2 bedroom summerhouse at the front of the island. When the house was compulsory purchased in 1940 the internal fittings were auctioned by Harrods and the catalogue still exists. After WWII the fort was then acquired by a local solicitor who rented the property, and the travel writer Norman Lewis is recorded as staying there in 1947- 1948. The fort was sold to a Tenby businessman in 1962 and in March 1968 the fort was turned into a zoo. the zoo and had two operators before relocating in 1979. The fort has effectively stood empty since this time.